Fred Friend studied history in Kings College, London. Next, he obtained a post graduate library qualification at the University College in London. Fred’s library career has spanned from Manchester University, to the University of Leeds, to the University of Nottingham and finally at University College in London. 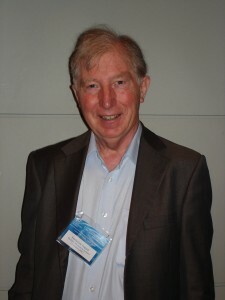 He currently holds the title of Honorary Director of Scholarly Communication at the University College in London. He is an OSI Open Access Advocate and a JISC Consultant. Friend is here today to discuss the future of scholarly journal publishing with the movement towards the Open Access model. He begins the session by letting the audience know that the publishers in the UK are saying Open Access will destroy scholarly publishing. He continues by listing the assumptions that the publishers have. Some publishers see Open Access as a threat, while others see opportunities in the new model. 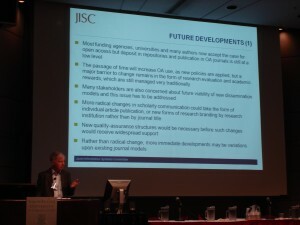 Many publishers want the change in model to support rather than weaken journal publication. Publishers put the emphasis on the quality of the journal, while researchers put the emphasis on the article. They want to see public money to help increase publication. Friend asks the questions, “What kind of business models can be made viable in the future? Which models will enable high and effective use of published research?” There are large areas of agree and disagreement. This is where the Joint Information Systems Committee (JISC) comes into the conversation. It is a national committee in the UK that provides universities and researchers with information that they need in order to make the right choice. JISC is a strong supporter of open access and want to help maintain the existing model. They want to help promote innovation especially in helping universities decide which are the best innovative approaches. JISC supports both “green” and “gold” open access development alongside support for licensing deals. They want to collaborate with other stakeholders of scholarly journal publishing within the UK and world. Friend is here today to see JISC have more collaboration with the Public Knowledge Project. The one key factor about providing information is the choice about cost and impact factor. JISC commissioned a report on the economic implications of alternative scholarly models. It also looked at how it would help the UK economy. Findings from the report showed that the UK benefited from moving towards either a self-archiving model or the gold Open Access model. It can get very fast returns by moving top open access (either green or gold). The Netherlands and Denmark have made similar reports. JISC also examines how much it will cost for institutions to switch models. They are trying to work with publishers on offering authors a choice between copyright and licensing. Many policy statements in Europe have supported Open Access. Collectively, the European Union committed to an Open Access policy research funded through FP7. Local European institutions are considering how to manage these Open Access changes. There is stronger interest in gold Open Access in Europe than in the United States. Globally, countries with newer growth economies and less established publishers do not appear to be more advanced in Open Access developments than ones with established economies. In future developments, Friend believes that there has to be a lot more in advocacy. Many researchers are concerned that their favourite journals will disappear. Fred says that academic journals will not collapse because of their importance to the research community. He believes their survival will come through changes in the repository. The academic community will take more control over the research dissemination process while publishers will act as service providers. Changes will happen, there will be variations and hybrids of new and old models. There will not be one model that will be able to dominate such as the subscription model has. Friend recognizes that changes will need to be made to the subscription model in order for scholarly publishing to remain. His presentation provides a positive outlook for publishers in a world with Open Access. Both models can survive together, but changes will need to be made by both. The key word in the presentation is “change.” Things cannot stay the same; changes will have to be made to the traditional scholarly publishing model. Friend encourages everyone to go out and advocate for these changes. He believes that is the way to change the traditional model. 1) One audience member said, “There are some green Open Access advocates who are very vocal about researchers …giving money to publishers when they can do it for less themselves. What is the cost of building institution repositories? Reply: “Green Open Access is the best value for money of the 3 models, which is evident at the national level in the UK, Netherlands, and Denmark.” Friend doesn’t believe it will be the sole model used. 2) How do you get over the problem of having researchers demand certain journals? Reply: Friend’s suggestion is to cancel subscription and buy gold Open Access journals. 3) Addressing the awareness of difference economies. Reply: Friend says that charges to each model are based on their cost in the current system. He thinks that the costs will settle down over time. There will still be variations in models because there are different costs involved. 4) Friend comments on the voluntary labour in the publishing models. Voluntary labour is not free because mostly the institutions subsidize it. Problems occur with certain inefficiencies such as people not skilled in what they are doing. People are spending time doing something that someone else can be doing better. 5) What makes you think that the cost will be better controlled in the new models? Reply: Friend believes that the academic community will control costs.